Nessebar on the coast of the black sea in Bulgaria was recommended to us by some lovely friends of ours as a great place to get a cheap week in the sun…some badly needed relaxation after our wedding and very active (though amazing) honeymoon. When people asked where I was going on holiday, my choice of Bulgaria was met with a few looks of surprise. I’d wholeheartedly recommend Hotel Italia in Nessebar…it’s quiet, the (bizarre circular) bed lulls you into an contented sleep each night, the pool is very clean and Chris has every vodka ever made. He’s also very proud of his 65″ TV by the pool! Before staying here, it’s important to understand that this is Bulgaria – a place often on different time zones. Most of it in the 70’s. The carpets aren’t pristine, the towels are hard and starchy and some of the electrics in the room are hanging out of the wall. I love the place though. It worked out at around £100 each for the week and we got excellent value for it. The hotel sits in a convenient location at the top of the triangle of new Nessebar with just a 10 min walk to old Nessebar. 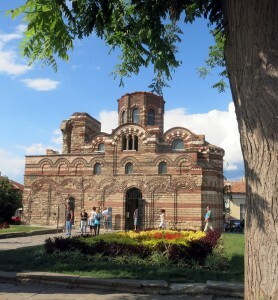 Old Nessebar has a few Roman / Thracian riuns and many crumbling and restored churches. 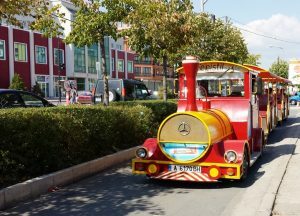 A water taxi and bright buses sit there ready to take you to Sunny Beach if you wish…quite a few staying in Sunny Beach come to Nessebar for the day. If you do fancy going to Sunny Beach (bit like Benedorm), I’d recommend either walking down the beach (good people watching!) or getting the little train (it’s not really a train….it’s like ones of those kid’s trains). In old Nessebar there are usually various stalls selling an amazing array of honey and turkish delights. There is a little beach at Nessebar…this snap was just after a storm had passed. All the restaurants in Nessebar serve pretty much the same menu. A variety of seafood and fish from salmon to sea fox (! )…pizzas…pastas (bolognese and carbonara)…chicken, pork and beef / veal. Most items are very cheap. A typical meal cost around 30lv (roughly £12) or less, which includes drinks. The beef, for some reason, is much more expensive. 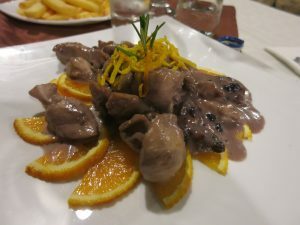 Meals, as with a lot of holiday destinations, are pretty hit and miss. We didn’t cover a lot in the week and Trip Advisor can’t really be relied upon (only a handful of reviews for each restaurant). 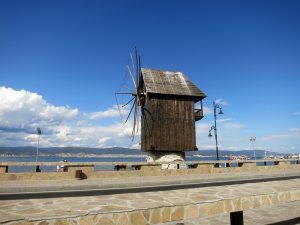 The restaurant called Kapitanska Sreshta at the far end of old Nessebar, overlooking the harbour was where we had our best meal – I had chicken with blueberries (it sounded so bizarre that I had to try it) which was actually really nice! We also had Camembert with almonds and honey, which was delicious. 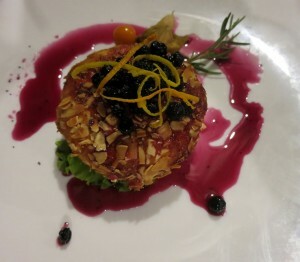 White Rose – Looks lovely and modern in comparison to the other restaurants. The lattes are delicious, as is the Somersby Cider….however the food isn’t great. The lasagne is pretty terrible and the salad (probably washed with non-bottled water) tasted nice….but I felt quite ill afterwards. Avoid Alexander‘s (near Jambo’s) – my other half got bad food poisoning from the pork. Quite a lot of the food isn’t piping hot…anywhere you go. Apparently this is a bit of a custom in Bulgaria. 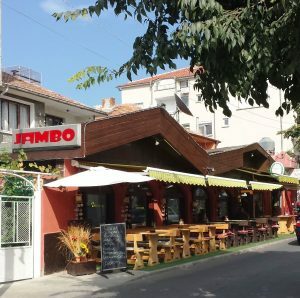 A lot of the restaurants in old Nessebar try to lure you in with promises of “we have everything!” but are mostly expensive and mediocre. The Bulgarians are very good at baking. There are a few bakeries which tempt you…the garlic flat bread, as I said, is really good. Vodka, vodka, vodka! Every bar does at least a few varieties and the servings are ‘small’ (50ml) and ‘big’ (100ml). This is quite a bit more than our usual British measure (a single is 30ml and double 60ml). We did have a lovely time (apart from the food poisoning). I’d recommend it for a cheap week in the sun. Next Post Superfoods? …or Snake Oil?